This ABET accredited Bachelor of Science Degree is designed for students seeking innovative careers in high-tech areas where multiple engineering disciplines merge. Graduates will be prepared to enter diverse areas such as mechanical controls, digital and analog electronics, instrumentation, robotics and manufacturing process control. The Physics-Engineering Dual Degree Program provides an option through which students may spend three years at SFA before transferring. Students who complete the Dual Degree curriculum will receive a B.S. degree in physics from SFA and a B.S. degree in engineering from their chosen engineering school. 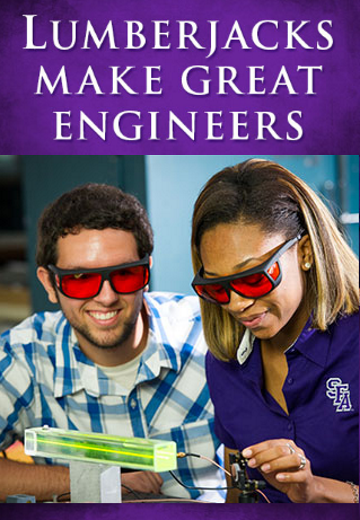 Students wishing to major in mechanical, electrical, civil, petroleum, chemical, or any of the many fields of engineering may take their first two years in pre-engineering at Stephen F. Austin State University and transfer to another university to complete their engineering degree requirements. A minor in engineering requires a minimum of 18 hours of engineering courses. Students with majors in physics, mathematics, chemistry, geology, or computer science can include this minor to enhance their high-tech degree. All minor programs must be approved on the degree plan by the Chair of the Department. NACOGDOCHES, TEXAS — Stephen F. Austin State University’s bachelor’s degree program in Engineering Physics has been accredited by the Engineering Accreditation Commission of ABET, the global accreditor of college and university programs in applied and natural science, computing, engineering, and engineering technology.